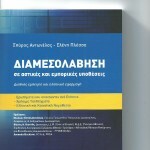 As authors of the first scientific textbook on Mediation in Greece, we attempted, with our book, to portray the theoretical and practical sides of a process with a long ancient history and contemporary use, with a Greek as well as a universal ethnicity that has made a significant contribution to quick and precise dispute resolution on an international level, in addition to playing a major role in promoting social cohesion and entrepreneurial spirit. A geographical one, which is focuses on Mediation’s utilization by the communal legislator (EU Directive 2008/52/ΕC) and by foreign legislators (Italy, U.K. and the State of California in the U.S.A.) for resolving disputes faster and relieving the courts of their high congestion of cases. 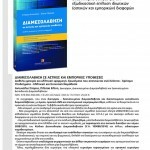 A procedure focused one, which analyzes a mediation procedure step-by-step in accordance with the provisions of the Greek Law on Mediation no 3898/2010, the Mediators’ Code of Conduct (M. D. 109088/2010) and other specific statutes’ provisions. There is also an array of sample agreements and other significant documents, used in a Mediation process so as to be effective and legally enforceable, given in the textbook. We wish you an enjoyable read and we would be happy to receive your feedback.